While waiting for a friend on a cold,foggy Sunday at 6.45 AM in January,in front of the famous Hawa Mahal, I clicked the below picture. The visibility was barely few meters,and the road was devoid of any traffic.With such a condition,everyone prefers to pull up on quilt rather than venturing out. But then, who wants to miss such a lovely view? Despite dense fog,the Hawa Mahal still looked splendid. hi! Ashish…I’m sure all such early mornings will be firmly entrenched…forever! Pingback: A year!! already? 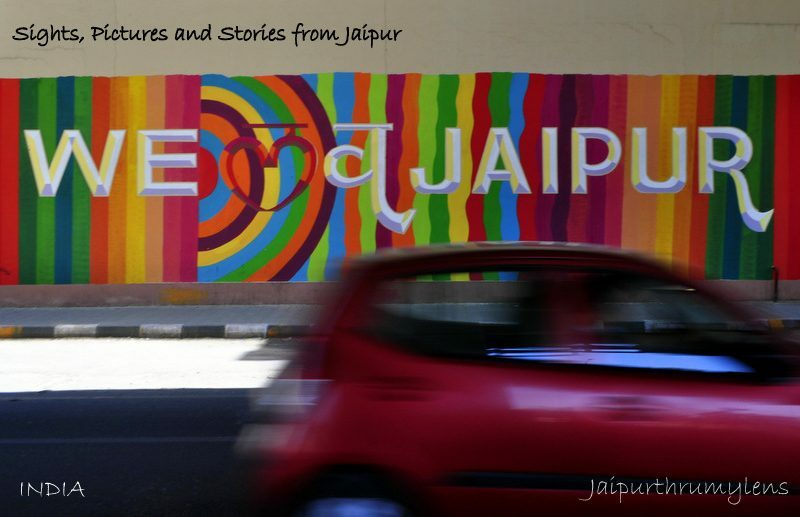 – Jaipur thru my lens !! Watching Hawa Mahal on a foggy day is tricky! This year there wasn’t any fog! This place is best seen when there is direct sunlight…it is quite alluring! Hawa Mahal is as synonymous with Jaipur as Eiffel Tower is with Paris! Pingback: Weekly Photo Challenge- Face/ Hawa Mahal – Jaipur thru my lens ! !